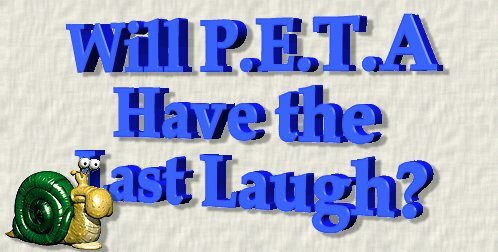 Will PETA Get The Last Laugh? Upstate New York, my stomping grounds, was heavily settled by the Dutch in colonial times. As a result many of the town names have Dutch roots. "Kill," the Dutch word for "stream" or "channel" is a common suffix in town names: Fishkill, Cobleskill, Peekskill, Wynanstkill and Catskill to name a few. A couple of years ago People for the Ethical Treatment of Animals, folks who would rather see a child die than annoy a hamster, added fish to the list of creatures they like better than humans. They decided the name Fishkill was wicked and pleaded with the mayor to change the name to Fishsave or Fishlove. Even after being informed the name literally meant "fish creek" PETA spokesmammal Anne Sullivan said, "the real issue behind the name of Fishkill is the violent imagery." Between bursts of laughter the mayor of the town said, "I think their proposal is idiotic." The residents agreed, and some wondered why no one complained about "Catskill." Anyone who has followed the exploits of the Animal Rights crowd has several funny stories to tell (along with a few scary ones). My favorite happened in France many years ago. They broke into an escargot factory and freed the snails. That's right - freed the snails. Imagine that scene: activists frantically waving their hands at the shelled bags of mucus shouting, "Run away, run away, you are free!" But don�t laugh too hard. Fringe groups have a nasty history of gathering power slowly, over time. They take baby steps while you're not looking. First you laugh at them, then you�re appalled at them, then you discover your favorite activity is illegal or heavily taxed. Having failed in their attempts to scare people away from meat, AR activists are now advocating a meat tax. Don�t underestimate them: they know the power to tax is the power to destroy. Since meat is unhealthy and ruining the ecology, they argue, it should be heavily taxed and the revenue should be used to subsidize vegetables. In other words, meat-eaters owe them dinner. #1 The world has had a large food surplus for decades. Famine is the result of political, economic and transportation issues, not meat production. #2 Jeremy Rifkin is loopy. But facts never stopped a fanatic, and the AR crowd will keep repeating their claims until people start believing them and/or they become law. Unfortunately, this technique works remarkably well. "But it will never happen," you say. "Too many people eat meat," you say. "Too many people depend on meat production for a living, and the beef lobby is huge," you say. "Stop interrupting," I say. The same arguments were made about the tobacco industry twenty years ago, and look what has happened to them. Most of the AR arguments don�t just resemble the anti-tobacco arguments � they are identical. The anti-meat lobby is small now, about the size of the militant anti-smoking crowd two decades ago. They�re gaining support from academia. (i.e., people who have earned impressive titles by avoiding work in the real world.) They have support from junk-science generators. They have carefully crafted arguments that will fool some of the people all of the time. This is the way such things start. They know an outright ban will never happen, so they�re proposing taxes, and even legislative limits on portion sizes. Just as bartenders are expected to refuse service to someone who shows signs of intoxication, fast food clerks may be legally forced to become nannies. It may be a decade or two in the future, but fat people (like me) who try to order a Double Whopper and a large order of fries may be told by the clerk, "I�m sorry, but I think you�ve had enough."